It's harvest time at our house again! We started with the cherries in early summer, then moved to the local fruits of the Caucasus and landed on (my favorite) the figs. Those have all come and gone and now the grape vines are groaning under the weight of their juicy green globes. So, we've been picking and picking and picking. 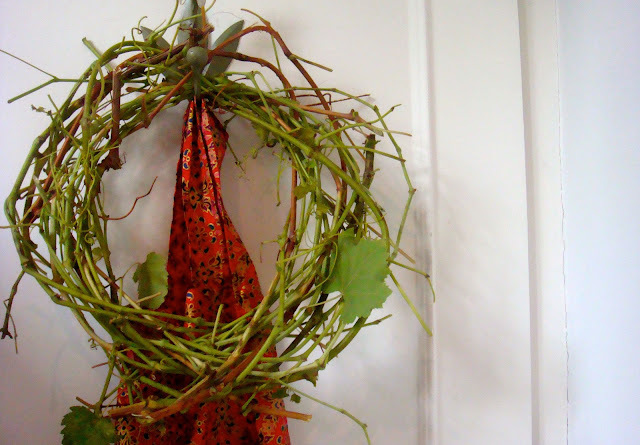 Lucky for me, I learned very young how to form grapevine wreaths. My parents created a mini vineyard in our backyard when I was a kid and I remember many a fall 'harvest' out soaking vines and watching my mom twirl them into wreaths. So, with my own kids watching and helping to strip leaves off the vines, I took my mother's place and twisted the green strands into wreaths for our home. My childhood home in the Pacific Northwest corner of America may be many miles away, but the experience of standing in my Tbilisi backyard during a grape harvest brought my feet right back to their roots. You write beautifully! I'm so happy to find your blog! Your spot on the internet is sunny and bright. I look forward to coming here! Your posts put my feet on the roots I'm creating for my children and place my head in the clouds with dreams of places I'd like to see. Thank you!